Regular dental care does more than simply keep your dental appointments to twice a year. It can also help you prevent all sorts of tooth problems and oral health issues from developing such as gum disease and more. Did you know, though, that there are habits that can interfere with our oral health and even make tooth problems worse? Read on to find out more about the top bad habits that will increase the need to visit your dentist more than the twice-a-year recommendation. This is the number one bad habit! Smoking cigarettes and even vaporizers can create all sorts of tooth problems, both in the short and long term. Not only can smoking cause your teeth to turn yellow with stains, but also it can encourage tooth decay, gum disease, and even oral cancer to start forming in your mouth—none of which we wish on any of our patients! While this is more of a cosmetic issue for teeth, wine and coffee are both highly acidic beverages. Fruit juice is also very acidic and contains excessive amounts of sugar, meaning tooth problems such as enamel wearing down and teeth turning discoloured are not only possible, they’re also expected. Yes, we know how much you love candy, sweets, and sugar. However, too much of a good thing is a bad thing! Sugar when eaten in abundance can and does result in cavities and tooth decay. Even root canals can occur if the decay is not treated promptly! It’s recommended to brush your teeth at least twice a day, and floss once per day. It’s easy to forget if you’re rushing to go to work in the morning or you’re running around taking care of many things all at once. Brushing twice daily is not something you should forget about though! Failing to brush every day can result in bad breath buildup as well as promote harmful bacteria growth in your mouth. Hard food examples we’re referring to include carrots, nut shells, ice cubes, popcorn kernels, and hard candies. All of these can cause a tooth to chip or crack if you bite down on them the wrong way! 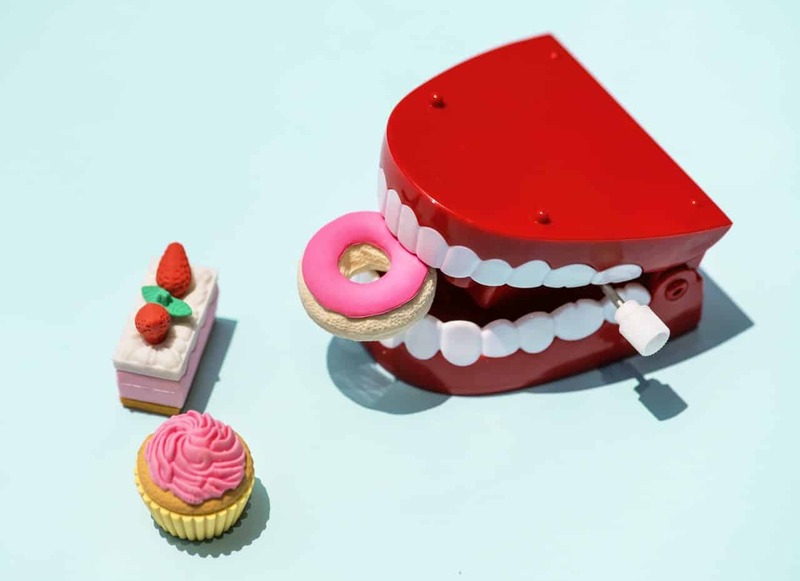 Likewise with biting down on hard foods, you should not use your teeth to perform tasks other than talking and chewing and swallowing your food. Yet there are people out there who use their teeth to do things such as open plastic wrapped items, or even as pop can openers to pry open the metal tab! These tasks can end up with you chipping your teeth. When you’re stressed out, you may grind your teeth while sleeping, even if you don’t realize it until the next morning when your jaw feels sore and tender. Grinding teeth can result in dental problems such as TMJ disorders. These problems are not only something to worry about for children while their adult teeth are growing in, but also for teens and adults who live a stressful life. The main way to prevent grinding is to bring it up with your dentist. If you cannot avoid the stress or cannot help but grind your teeth, we recommend you use a night guard to protect your teeth while sleeping. Flossing once a day can help keep food particles and foreign objects such as popcorn kernels from causing you discomfort. However, forgetting to floss even after you’ve eaten a meal and you don’t feel anything afterwards is a bad habit that can promote bacterial growth. It can also promote—you guessed it—cavities. While it’s a good idea to brush your teeth twice daily, it’s not as good an idea to brush them very hard. Doing so can wear down the hard enamel covering your teeth and expose the more sensitive layers thanks to the extra pressure you’re applying. Be gentle next time! Your dentist can help you kick these bad habits to the curb. Talk to us if you need assistance with forming good habits around oral care. We can help you figure out how best to keep your dental appointments to the twice-a-year recommendation. Creative Commons Attribution: Permission is granted to repost this article in its entirety with credit to Westboro Dental Clinic and a clickable link back to this page. When Should Kids Go to the Dentist?What Causes Bad Breath?